← Spring Fling is Saturday, March 10th! 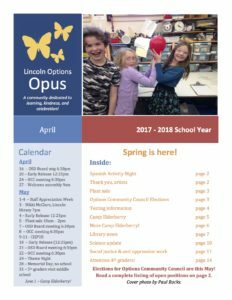 Read about Spring Activities such as the Plant Sale, Spanish Activity Night, and Camp Elderberry. Follow us on Facebook for more Lincoln news. Looking for a previous edition? Click here for the OPUS Archive. This entry was posted in Options OPUS. Bookmark the permalink.